I made these cards for a village class, so I kept them quite simple. The paper is from kaisercraft – telegraph road,and I added some lace, ribbon and flowers,punched leaves and stamped sentiments.Well, we are still hot here in adelaide,so far this month we haven’t had a day under 25c, so quite looking forward to winter this year!! I started work super early today, so home early, I am going to prepare some tea, and have a nice seat under the air conditioner duct with my book. Til tomorrow…. I bought the range of Kaisercraft Telegraph road last month, but haven’t had much spare time to create with it. I did make this one,with the 12 a 12 papers, even the band across the bottom is a piece of the paper ( looks like a ribbon doesn’t it! )and the chipboard flower was a piece lying on my desk – I think it came with some freebies on a magazine. 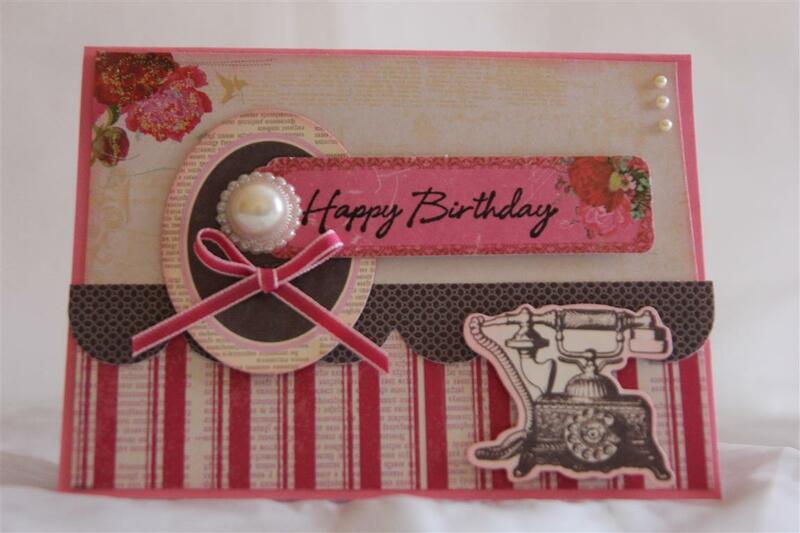 the cardstock is some retired stampin up cardstock – that was the last piece I had, a shame really because it goes so well with this paper! til tomorrow…. 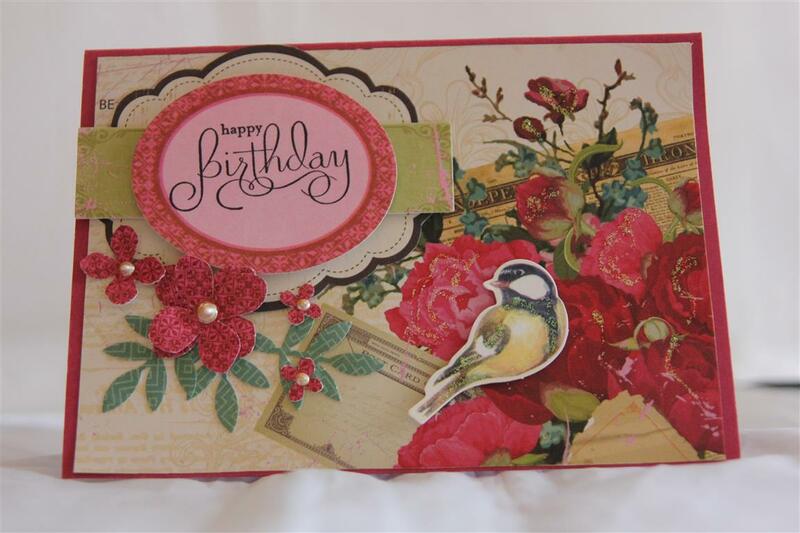 Todays Kaisecraft Telegraph Road card uses a corner of a 12 x12 sheet and the matching collectables. I was going for a collage effect, so layered a few of the collectables on top of easch other. I did some punching with martha stewart punches for the leave and flowers ( leaf and hyacinth punches) and added some gold liquid pearls and kindyglitz to finish. 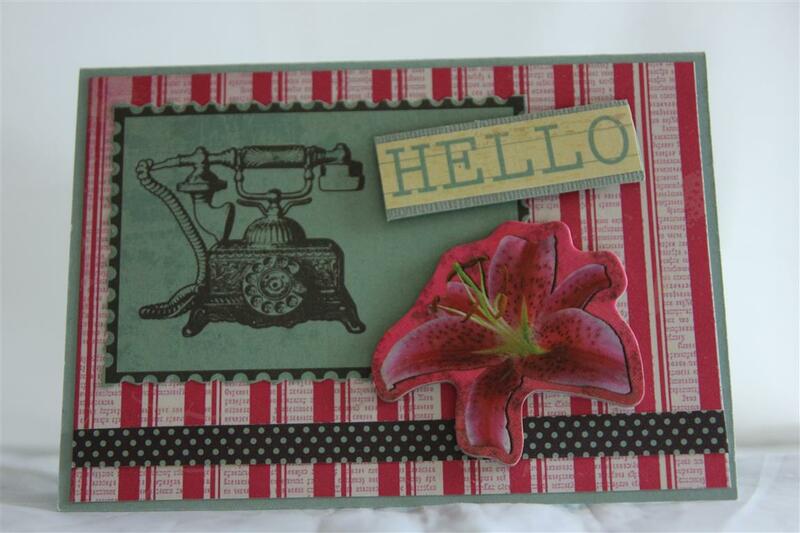 the cardstaock and sentiment stamp are from stampin up. Til tomorrow…..